Michael’s Keys Locksmith is a professional all around security company. One of our groups specialize in the sales, service and moving of safes. We have many shops throughout the Metroplex where you can look at our safes and talk to a “real expert”. Our new Keller location is a good place to learn more about safes and purchase a safe that meets you needs. 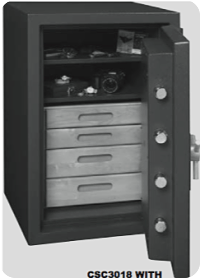 We have many safes available in many sizes, shapes, fire ratings, and even some special rated safes. We even have a safe specially designed just for us by American Security. American Security is one of the leading safe manufacturers and we carry or can order any model they make. That’s how confident we are in their products. We also move safes, repair safes, and perform safe maintenance. Our “safe group” specializes getting your safe installed without causing any damage to your property. We’ve been doing this for over 20 years and we know how to keep our customers happy. Check us out on Angie’s List or Google us to see what out happy customers have to say. When buying a safe there are several things you must be aware of. In most cases you will have size and space constraints. Measure the place where you want to locate the safe before you buy. This will be really be helpful to your Michael’s Keys locksmith and make it a lot easier to get you in the perfect safe. Returning a new safe is no fun for either of us. Measure before you call or come in for a visit. Also, make note of how wide your door openings are if you are buying a large safe. Your locksmith will be better able to help you choose your safe if he knows this measurement. Fireproof requirements are also important. Of course, the higher the requirement the higher the cost. Our experts can help you make a “realistic” assessment of you needs in this area. You don’t want to be under-protected and you don’t want to pay for something you don’t need either. Safe type is also important. If you are a commercial business you may need a huge freestanding safe, or just a small drop safe. If you are a home owner you may have a preferences for a wall safe or a floor safe, or perhaps even a Gun Safe. Having a good general idea of what you want, using the criteria above will help your Michael’s Keys locksmith guide you to your perfect safe solution. If all of this is too confusing, just come in and talk. We love talking about safes and all the modern features they have. We look forward to seeing you soon. Gun Safes – One of the most popular types of safes we sell today is the Gun Safe. Typically these safes are freestanding and vary greatly in size from a small Pistol Safe to medium and even huge Gun Safes that can accommodate several large caliber rifles. Fireproof Safes – Many people come in asking for safes that are fireproof (sometimes referred to as a Fire Safe). There is no such of a thing as a fireproof safe. Any safe made by man, when subjected to a hot enough fire over a long period of time will sustain damage to itself and its contents. Safes are merely fire resistant. Our safes are designed to keep the temperature in the safe down to 350 degrees F, for a specified amount of time. The things to look for are the outside temperature and the length of time. These are two of the things that affect the price the most. Home Safes – This term usually signifies a Wall Safe or Floor Safe, but can also be a Gun Safe of a Jewelry Safe. They come in sizes, as well as burglar and fire resistance. Commercial Safes – The Commercial Safes, of the types listed above, are usually more robust than a home safe. Drop Safes and Depository Safes also fit in this category. If you have any questions, give us a call. We are always willing to help. After all, your safety and security is our most important goal . We love what we do and we are always glad to talk about it. We recommend AMSEC Safes – the security and value leader!